This session will show you the regulatory background and authorities expectations on a suitable pest control programme in the field of GMP manufacturing. Additionally experts from manufacturing, laboratory and pest control companies present their experiences in developing and implementing a suitable pest control strategy. The presentations will cover the requirements for different areas and cleanroom classes and laboratories. Amongst the classic traps for rodents and insects, the course provides you information about modern online controlled pest control systems. 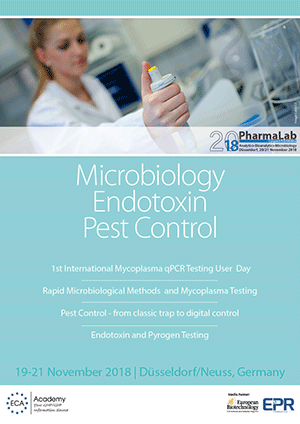 Many national and international regulatory guidelines ask for a conclusive concept of pest control for pharmaceutical and biopharmaceutical manufacturers. But details what and how to do that can’t be found in these documents. It seems that this effects that the complexity and importance is underestimated. Mostly the small organisms of microbiology get more attention than the “big animals” that can be seen with the human eyes. For an integrated and effective system to avoid pest infestation, a risked based approach for buildings, rooms and manufacturing conditions must be evaluated. Additionally the monitoring of the preventive actions, the traps and the corrective actions in case of pest infestation must be conceived. Therefore, the exchange of information and a structured cooperation of the responsible persons of the manufacturer and maybe of the contact pest control supplier is essential. Head of Division“ Pharmaceutical Laboratories”. Business Unit Manager Pest Management Benelux.